Immune-mediated attack on axons and myelin sheath. During MS and EAE, axonal damage and demyelination are initially mediated by the inflammatory response within the CNS. (i) CD4+ Th17 cells produce GM-CSF, which activates macrophages and microglia. 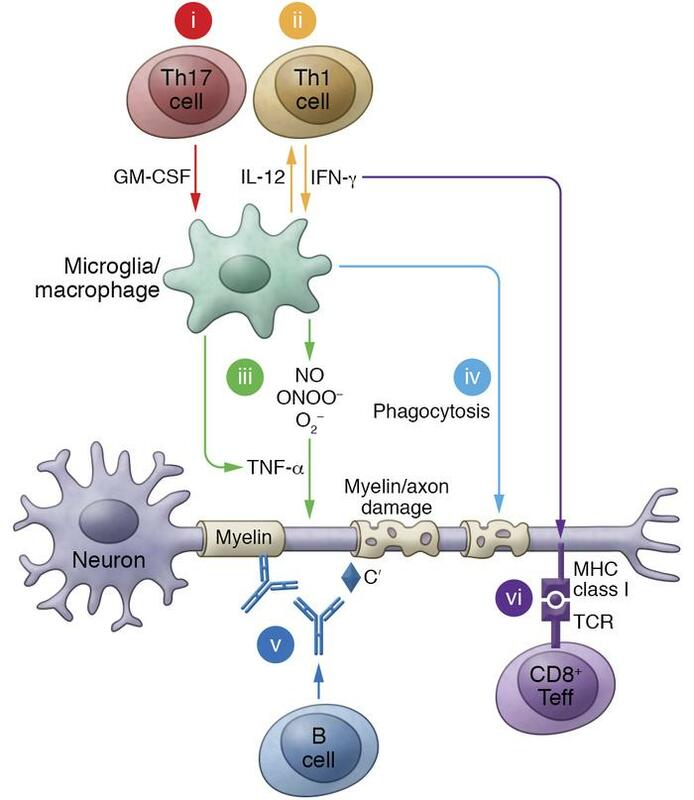 (ii) CD4+ Th1 cells invade the CNS and produce IFN-γ, which activates macrophages and microglia to produce the cytokine IL-12 (the major promoter of Th1 cytokine production). (iii) Macrophages and microglia also produce nitric oxide (NO), peroxynitrite (ONOO–), and superoxide (O2–), which are each capable of mediating cellular damage. This capability is enhanced by microglia- and macrophage-derived TNF-α production. (iv) Activated macrophages and microglia may also consume damaged myelin sheaths and axons. (v) B cells produce antibodies that bind to myelin sheaths and may promote complement-mediated damage (C′). (vi) IFN-γ upregulates the expression of MHC class I by resident CNS cells, potentially inciting a CD8+ cytotoxic T cell response.